Sam Guay is an illustrator primarily focused on personal works exploring lucid dreams, sensory deprivation, and unseen emotional worlds. She’s currently working to finish the Blood Moon Tarot, a full tarot deck, in early 2018. Sam lives and works in the woods of New Hampshire. Her work has been included in publications such as Nightmare Magazine, Spectrum, and ImagineFX. Her portfolio appears at samguay.com. She provided art for this week's story, "The Glow-in-the-Dark Girls" by Senaa Ahmad. This interview was conducted by email in December 2017. 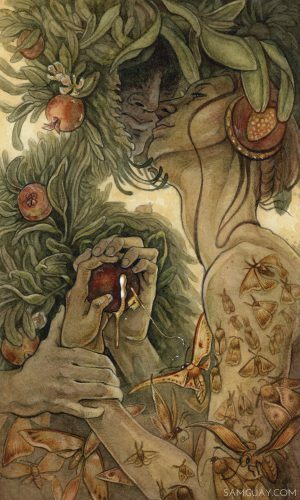 Sam Guay: If there was a specific moment I would attribute to being where I am today, it would be the moment I decided to take a mentorship with Rebecca Guay (no relation). At the time I was feeling very directionless. I knew I wanted to continue with my art, but I hadn’t found the place where my art belonged, I hadn’t developed my skills, and I knew next to nothing about the business side of illustration. 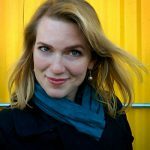 The experience helped me find my voice, and it introduced me to the F/SF illustration community, which has been a huge source of support for me. been a mixture of taking risks that paid off, putting a lot of time into my work, having the support and knowledge of my peers, and having the determination to work though my failures and doubt. Tory Hoke: Your "Blood Moon Tarot" series is fresh, fascinating, and massively ambitious. What drives you to take on this series? What are your goals for it? Sam Guay: Thank you! I’ve been reading tarot for over a decade now, and I’ve always been drawn to the idea of using symbolic art to invoke introspection and to aid in reconsidering our approaches to the many difficulties of life. I’ve wanted to make a tarot deck using my personal experiences as a filter for the iconic imagery and interpretations. Right now my goal is to wrap up the final paintings for it and run a Kickstarter in May to get it printed. I’m excited to get the deck into people’s hands and see it in use. Tory Hoke: The hands in your portfolio are exquisite. Depicting hands is a challenge for many artists, but you seem to take active delight in them. How did you develop this skill? What is your approach? Sam Guay: I’ve always heard that people really enjoy seeing beautiful hands in artwork; I know this is true for me. Hands are also incredibly expressive. They’re complex, graceful, and maybe even a bit magical—because of the importance of my own hands in making my work. I spent a lot of time looking at the work of artists I loved (Mucha, Klimt, Rebecca Guay), and I looked at their approach to hands: the shapes they made, how they wove the hands together, and how they simplified and exaggerated the forms. When I’m drawing I try to make sure that the hands are engaging and are considered as much as any other part of the piece instead of being a second thought. Tory Hoke: What inspires your creations? What effect do you hope to have on your viewer? Sam Guay: For me, inspiration comes from a lot of places: nature, stories and poetry, music, other art, etc. For this tarot deck I’ve been doing a lot of introspection, exploring the themes of each card and how I personally connect to them. The initial inspiration for a single card could come from dozens of places, and the manner in which I connect those ideas results in the final image. As part of my process I’ve been using sensory deprivation tanks, aka float tanks, which let me have the space to play with ideas and let my imagination run wild. It was something that I was introduced to during a college class, and I enjoyed the experience so much that I’ve stuck with it over the years. temperature. The result is that you’re deprived of sensory input and usually your brain doesn’t know what to do with itself so it gets very imaginative or relaxed. I’m never exactly sure how viewers will be affected by my work, but I do hope my work has the right balance of symbolism and atmosphere that they can personally connect to it in their own way. I always love hearing how people interpret my imagery, especially when it’s different than what I’d imagined. Sam Guay: I live in a very rural area so there’s not much here. I have some local musician friends and we’ll trade music for my YouTube videos for art to use on their show posters—mutually supportive things like that. When I want to have a drawing night with my fellow F/SF people, I usually have to drive in to Boston or Providence, which is a bit of a trek for me. Most of my community interactions are online via various social media platforms. Then a few times a year I’ll see my peers at conventions. 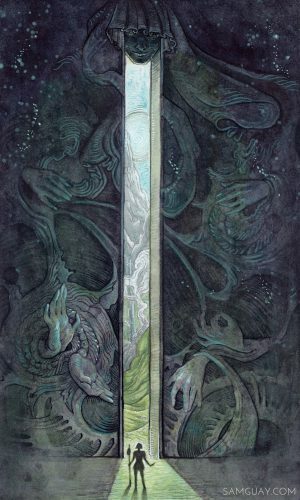 Sam Guay: There are so many: Moebius, Arthur Rackham, Klimt, Mucha, Sulamith Wulfing, Stephanie Law, JAW Cooper, Inka Essenhigh, Victo Ngai, Yoshitaka Amano, Sergio Toppi, Joao Ruas, Kilian Eng, Josan Gonzalez, Sean Andrew Murray, Allison Sommers, Aaron Horkey … the list goes on. I suppose one of my most unexpected inspirations would be Hanne Friis, a fiber artist; I almost always have their work around for visual inspiration. Sam Guay: I might like to see a little less fantastical realism and some more stylized or abstract work become mainstream. It’s interesting to see how things might look realistically, but I enjoy work that leaves you room to use your own imagination or focuses more on the mood than the mechanics of things. Sam Guay: I have a lot of dream projects, most of which include bringing other skills such as music and writing into the project. I’d love to work on a project with a massive collaborative effort such as a movie or video game. Seeing so many people put together their diverse skills to create something powerful with a life of its own really moves and inspires me. 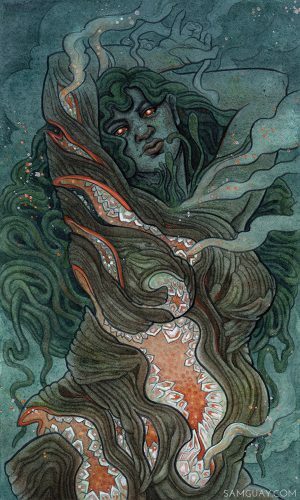 Sam Guay: After this tarot deck? There are tons of possibilities, but I haven’t decided on anything yet, so it’s a mystery for now.